Jamaica’s only nighttime attraction, the Luminous Lagoon is one of four of the world’s bodies of water that light up with a turquoise glow. 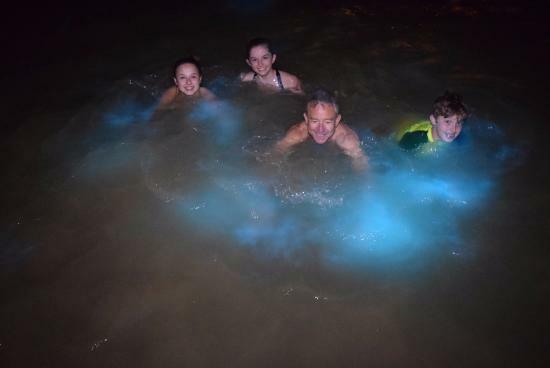 Located on the outskirts of Montego Bay, the lagoon emits a phosphorescent light when touched. Witness magic take place right before your eyes as you enjoy a quiet boat ride through the night-lit marina. Historical stories of Falmouth are told before guests are invited to take a swim, which is highly recommended. An authentic Jamaican meal concludes your tour. Tour times are between 7-8:30 PM. Guests should wear their bathing suits, bring a towel and a change of clothes. Guests should be advised that the effect of the lagoon is very difficult to photograph. Luminous Lagoon is a 2 hour ride from Negril. Luminous Lagoon is a 30 minute ride from Montego Bay.